Human B7-2, Fc Tag (CD6-H5257) is expressed from human 293 cells (HEK293). It contains AA Leu 26 - Pro 247 (Accession # AAH40261). The protein has a calculated MW of 51.5 kDa. 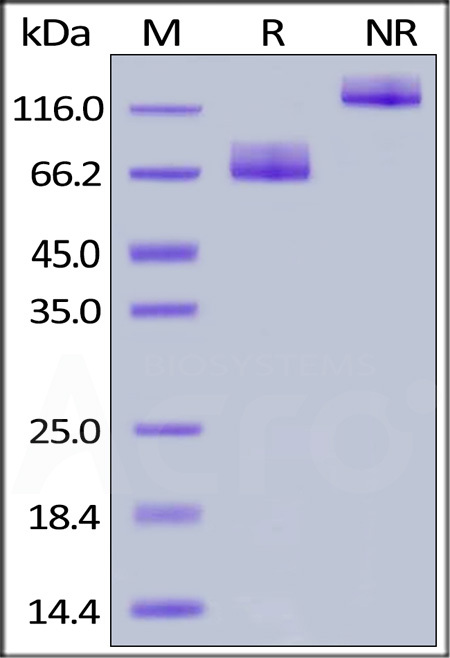 As a result of glycosylation, the protein migrates as 66-86 kDa under reducing (R) condition, and 120-140 kDa under non-reducing (NR) condition (SDS-PAGE). Human B7-2, Fc Tag on SDS-PAGE under reducing (R) and non-reducing (NR) conditions. The gel was stained overnight with Coomassie Blue. The purity of the protein is greater than 95%. Immobilized Human B7-2, Fc Tag (Cat. No. 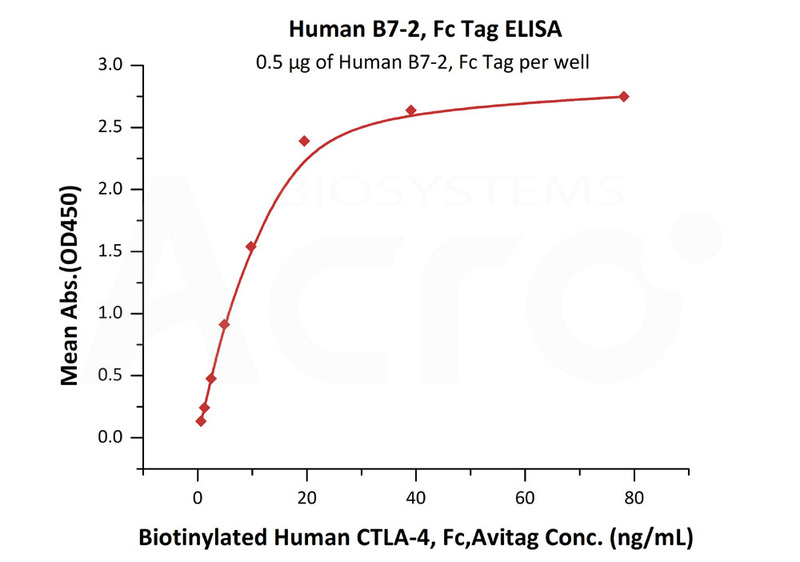 CD6-H5257) at 5 μg/mL (100 μL/well) can bind Biotinylated Human CTLA-4, Fc Tag, Avi Tag (Cat. No. CT4-H82F3) with a linear range of 0.6-10 ng/mL (QC tested). 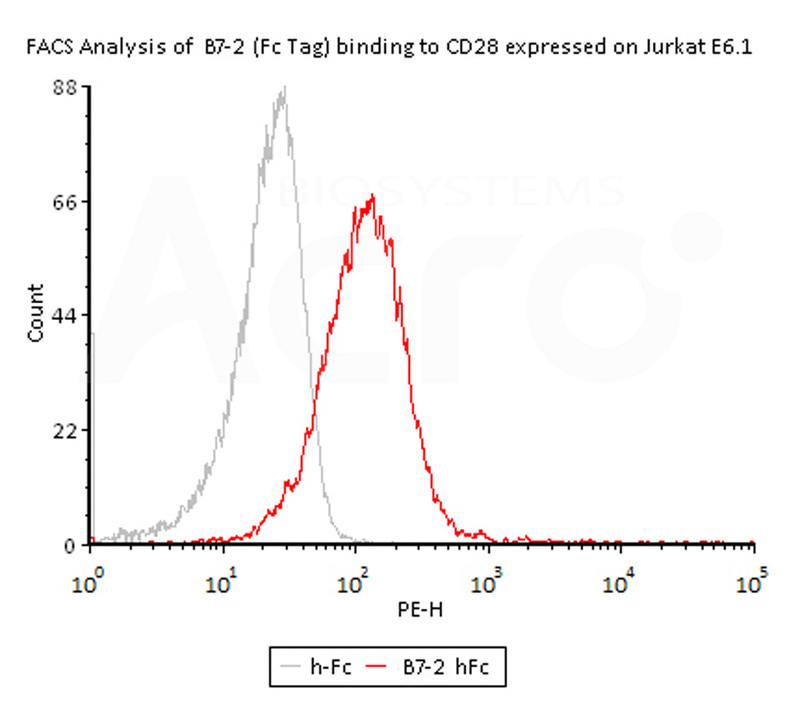 Flow Cytometry assay shows that recombinant Human B7-2, Fc Tag (Cat.No. CD6-H5257) can bind to CD28 expressed on Jurkat E6.1. The concentration of B7-2 used is 2 μg/ml(Routinely tested). 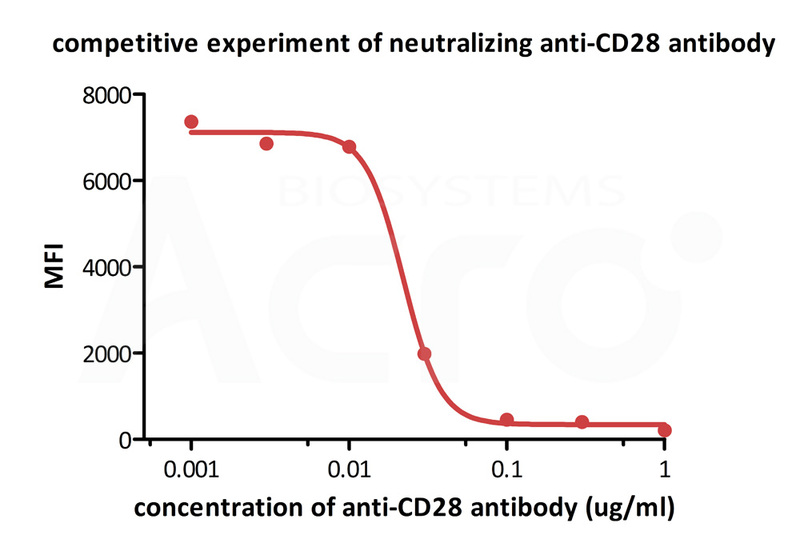 FACS analysis shows that the binding of Human B7-2, Fc Tag to CD28 expressed on Jurkat E6.1 was inhibited by increasing concentration of neutralizing anti-CD28 antibody. The concentration of B7-2 used is 2 μg/ml. The IC50 is 0.022 μg/ml (Routinely tested). 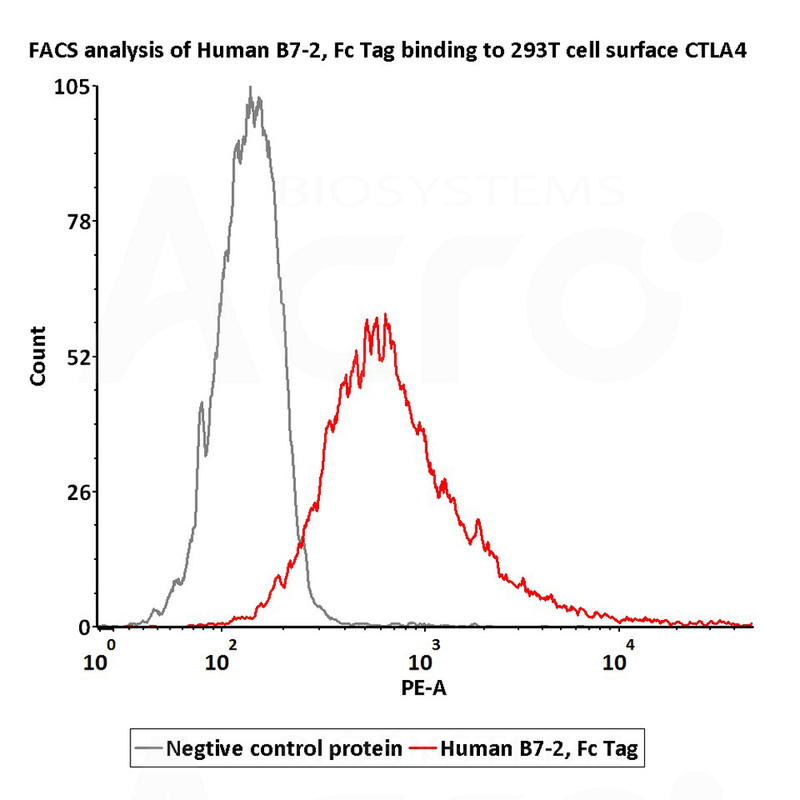 FACS assay shows that Human B7-2, Fc Tag (Cat. No. CD6-H5257) can bind to 293T cells overexpressing human CTLA4 protein. The concentration of Human B7-2 is 3 μg/ml (Routinely tested). Authors: Grzegorz B. Gmyrek, et al. Cluster of Differentiation 86 (CD86) is also known as B-lymphocyte activation antigen B7-2, is a type I membrane protein that is a member of the immunoglobulin superfamily, and is constitutively expressed on interdigitating dendritic cells, Langerhans cells, peripheral blood dendritic cells, memory B cells, and germinal center B cells. Additionally, B72 is expressed at low levels on monocytes and can be upregulated through interferon γ. CD86 is the ligand for two different proteins on the T cell surface: CD28 (for autoregulation and intercellular association) and CTLA-4 (for attenuation of regulation and cellular disassociation). CD86 works in tandem with CD80 to prime T cells. Recent study has revealed that B7-2 promotes the generation of a mature APC repertoire and promotes APC function and survival. Furthermore, the B7 proteins are also involved in innate immune responses by activating NF-κB-signaling pathway in macrophages. CD86 thus is regarded as a promising candidate for immune therapy. CD86+ macrophages in Hodgkin lymphoma patients are an independent marker for potential nonresponse to firstline-therapy. (1) Chen C, et al., 1994, J. Immunol. 152 (10): 4929–36. (2) Yadav, D. et al., 2007, J. Immunol. 178: 6236-6241. (3) Steidl C, et al., 2010, N. Engl. J. Med. 362 (10): 875–85.